HUNTINGTON BEACH – Ocean Defenders Alliance, an organization working to protect marine ecosystems through meaningful action, christened its newest boat on Oct. 1 in Huntington Harbour. The unveil of the 55-foot boat marks the completion of three months of retrofit work. Bob Barker, longtime television game show host and animal activist, donated $150,000 to Ocean Defenders Alliance to help the group purchase a vessel and major equipment for their work along the California coast, removing large quantities of abandoned or lost fishing nets and gear. “Without Mr. Barker this would never have happened,” said Capt. Kurt Lieber, president and founder of Ocean Defenders Alliance. “We never could have gotten a boat of this caliber. “When it came time to name the vessel, I didn’t even consider other options. I simply couldn’t imagine his name not being on it,” he added. Upgrades to the boat include, a custom built dive ladder, which was fabricated and donated by ROC Industries in San Diego; removal of a bait tank in the cockpit, which was replaced it with an outdoor head and changing room; fabricated and installed benches for divers to sit on while they gear up; fabricated and installed a bench in the salon that will double as a bunk bed, increasing the sleeping berths to a total of eight, and replacement of leaking hoses. Some batteries were also moved under the cockpit to make room for a dive compressor and general maintenance was performed on the boat. “Abandoned commercial fishing gear kill untold thousands of marine animals each year. Whales and dolphins, as well many other species, become entrapped in discarded fishing equipment and die horrific deaths,” explained Bob Barker in a prepared statement. “The Ocean Defenders Alliance is the leading organization dealing with this problem and I’m delighted to be able to do my part to help. I’m happy to report that the LegaSea workboat, adapted from a 55-foot Chris Craft, is designed to deal with this problem and is already out on its first mission.” While much has been done to the boat, there is always work to be done – as any boat owner understands. Lieber encourages boat mechanics, electricians, cooks deck hands and others to volunteer their time to help keep the boat in top shape. 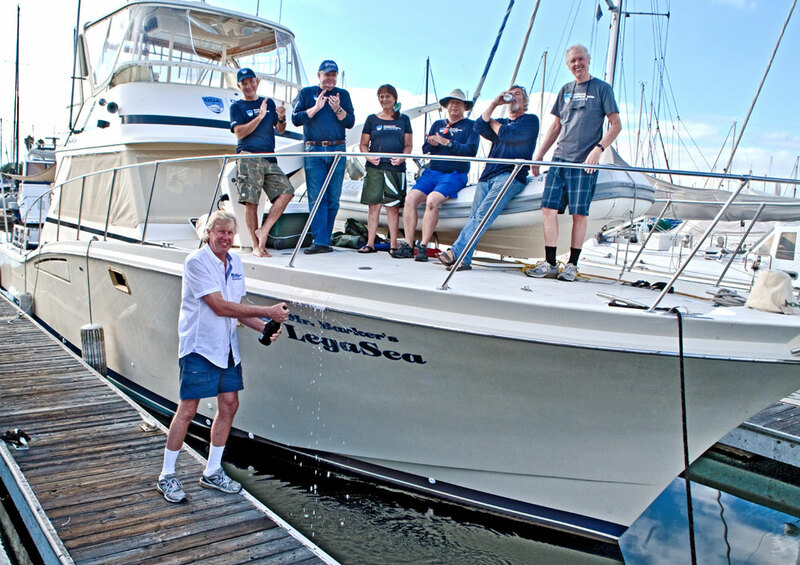 After a christening and boat naming ceremony, Ocean Defenders Alliance launched the boat which has already hauled in five abandoned lobster traps and 250 feet of trap line. The organization currently utilizes its 40-foot vessel, Clearwater, for cleanups. The day boat does not allow for overnight stays and is unable to navigate to more remote sites. The furthest island it is capable of reaching is Anacapa. Mr. Barker’s LegaSea will work to cleanup areas off the northern Channel Islands – including Anacapa and Santa Rosa islands. Roughly $130,000 was additionally raised through fundraising coordinated by Ocean Defenders Alliance.